During Q12017 earnings call, Apple CEO Tim Cook noted that Apple Pay's volume was up over 500% compared to last year. 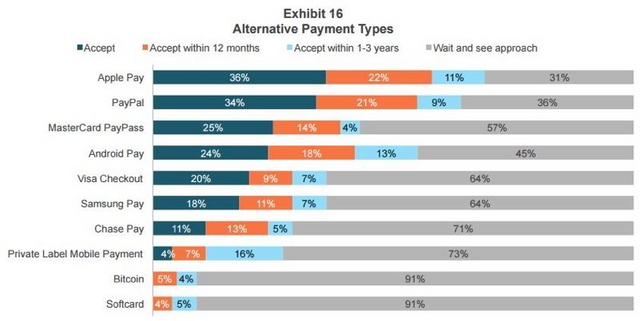 With Apple Pay now accepted by 36% of retailers in the U.S it is now the No. 1 mobile payments processor, closely followed by PayPal at 34%. "Apple Pay transactions were up nearly 500% year-on-year for the September quarter. In fact, we completed more transactions in the month of September than we did across all of fiscal 2015." - Tim Cook, CEO Apple fourth-quarter 2016 earnings call According to a recent survey conducted by Boston Retail Partners, Apple Pay is now accepted by 36% of the retailers in the U.S., with another 22% expected to start accepting Apple Pay in the next 12 months.